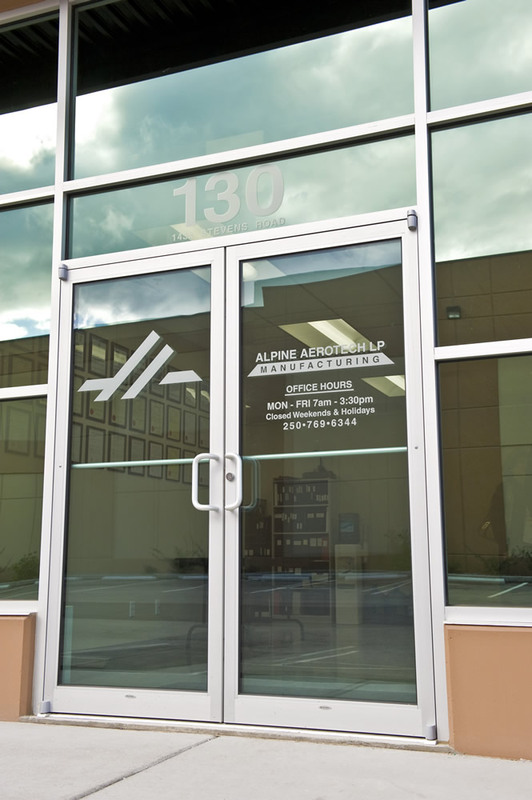 Alpine Aerotech Building | Argus Properties Ltd. The construction of the West Kelowna Business Park building ‘C’ completed on July 27, 2013. This was a build to suit for Alpine Aerotech, a “Platinum Certified” Bell Helicopter Textron approved Customer Facility, and provider of comprehensive worldwide helicopter support and aircraft maintenance services. The building encompasses 24,000 square feet of space, with 24 feet of clear plant space. There are oversized doors to accommodate the manufacturing aspect of the facility, and customized electrical service for high power usage. The building’s concrete foundation and slab-on-grade concrete tilt-up walls makes this a solid manufacturing building to suit Alpine Aerotech’s needs. Long span roof joists were utilized during the construction, resulting in minimal internal columns, and allowing for maximum space usage. The walls are lined and insulated, and with the two-ply bitumen insulated roof system, this increases the energy efficiency within the building. Space was laid out to facilitate a smooth flow production line from the receiving door to the delivery point. The design of the building maximizes the potential of the building to allow for any future changes to the mezzanine floor space. What made the construction of this building so special was the system of building during the construction phase that allowed the client to be able to begin equipment, and system installation while the building process was in progress! A build to suit project made just to order.